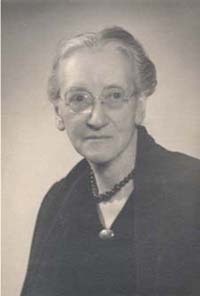 On November 14, 1946, Emily Greene Balch became the third woman to be awarded the prestigious Nobel Peace Prize.1 In commemoration of that event, The Albert M. Greenfield Center for the History of Women’s Education has compiled the following biographical overview of Balch’s remarkable life and achievements. 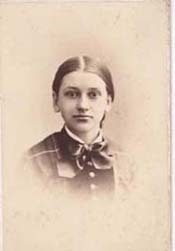 One of Bryn Mawr College’s most distinguished alumnae is Emily Greene Balch, who, in 1889, became a member of the the school’s first graduating class. In an era in which bachelor’s degrees for women were still a novelty and post-college careers were even more rare, Balch set herself apart by effecting real change on both the local and global scale. Her history stands in direct opposition to the dissenting voices of her time that asserted that women were not worth educating, and her achievements appear no less remarkable today. Balch was also a dedicated student: her excellent academic performance at Bryn Mawr, where she took her degree in Greek and Latin, culminated in her being awarded the prestigious European Fellowship to fund a year of further study abroad. After a year studying sociology in the US, she applied the funds from her fellowship to a year at the Sorbonne to study poverty alleviation policies, and returned to Boston determined to apply her education to the task of realizing her moral convictions. 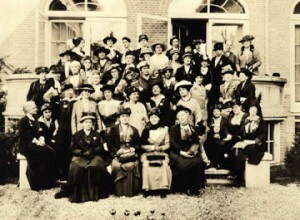 Her most notable achievement during her first years out of school was the 1892 founding of the Denison House College Settlement, an initiative to bring “social and educational services into a poor immigrant neighborhood” by integrating educated women and the urban poor in a living environment.3 From early in her career she acted on the belief that the most effective way to create change was by erasing divisions between groups of people, fostering contact and mutual understanding. Driven by a desire to instill her own compassion in others, she decided to become a teacher and joined the faculty of Wellesley College after several more years of preparatory study. Though she was successful as a professor, Balch continually prioritized hands-on work and research, taking leave (both paid and unpaid) to conduct research on Slavic immigrants. This effort produced the highly acclaimed work Our Slavic Fellow Citizens (1910). 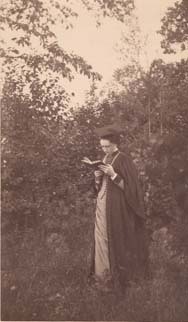 In 1913 she became the chair of the Department of Economics and Sociology at Wellesley. Balch advocated unequivocally for peace in the years leading up to and during the First World War. Her active involvement in international politics began while she was still teaching at Wellesley: in 1915 she joined the International Congress of Women at The Hague, an organization that took the stance of promoting mediation rather than military action in response to the conflict in Europe. However, her outspoken avowal of peace during the war was controversial, eventually leading to her dismissal from Wellesley College. After departing from Wellesley in 1918, Balch continued to champion peace both in her editorial work with The Nation and in her co-founding (with Jane Addams) of the Women’s International League for Peace and Freedom. In 1946, she became the third woman to be awarded the Nobel Peace Prize. 1. The first was Bertha von Suttner in 1905; the second was Jane Addams (close friend and colleague of Emily Green Balch) in 1931. This entry was posted in Uncategorized and tagged alumnae, biography, Charles Fletcher Dole, Denison House, Emily Greene Balch, International Congress of Women, Jane Addams, Nobel Peace Prize, quaker, The Nation, unitarian, Wellesley College, women's history, Women's International League for Peace and Freedom by Evan McGonagill. Bookmark the permalink.